^ Room full of mirrors, c cross, hyperion, 2005, p. 33-41. ^ Hendrix, James A. (1999). My Son Jimi. AlJas Enterprises. ^ Kathy Etchingham and Andrew Crofts (1998). Through Gypsy Eyes. Orion. ^ Gary Gealdart & Steve Rodham (2008). From The Benjamin Franklin Studios Part 1. p. 318. ^ Gary Geldeart & Steve Rodham (2008). The Studio Log (2008 ed). p. 74. ^ Keith Shadwick (2003). Jimi Hendrix, Musician. Backbeat Books. p. 240. ^ Cross, C. (2005). Room Full of Mirrors. p. 334. ^ Kincheloe, Joe L.; Horn, Raymond A. (2008). The Praeger handbook of education and psychology. Greenwood Publishing Group. p. 849. http://books.google.co.uk/books?id=ZDRUDrFdSIsC&pg=PA848&dq=Jimi+Hendrix+widely+considered&ei=2vngSa6jHYy0yQTb3tCaDQ#PPA849,M1. ^ Blues CD, MCA, sleeve notes by Jeff Hannusch, p. 2. ^ A Film About Jimi Hendrix deluxe ed. DVD, Warner Bros. sp. feat: From The Ukelele to the Strat, Faye Pridgeon Interview. ^ Shadwick, Keith (2003). 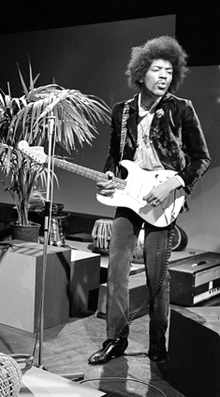 Jimi Hendrix, Musician. Backbeat Books. p. 39. ^ Egan, Sean (2002). The Making of Are You Experienced. A Cappella books. ^ Bossy, Michel-André; Brothers, Thomas; McEnroe. John C. (2001). Artists, Writers, and Musicians: An Encyclopedia of People Who Changed the World. Greenwood Publishing Group. p. 85. http://books.google.co.uk/books?id=r0SOzr_0Ya4C&pg=PA85&dq=Jimi+Hendrix+widely+considered&ei=c_fgSeexJJS0zgTqlPm7DQ#PPA85,M1. ^ Shadwick, Keith (November 2003). Jimi Hendrix, Musician. Hal Leonard. p. 92. ISBN 0879307641. ^ Trynka, Paul (1996). Rock Hardware. Hal Leonard. pp. 18. ISBN 9780879304287. http://books.google.com/books?id=HDrIjd5FQ8QC&pg=RA19 2010年2月5日閲覧。. ^ Davis, Miles; with Quincy Troupe (1989). Miles. The Autobiography. New York: Simon & Schuster. pp. 282–283. ISBN 0 330 31382 7. ^ Davis, with Troupe (1989), Miles, pp. 319–320; 374. ^ Watson, Ben (1996). Frank Zappa: The Negative Dialectics of Poodle Play. St. Martin's Press. p. 88. ISBN 0312141246.